The northern segment from Pape Station to Don Mills and Sheppard. The alignment for the southern segment has been settled for some time, but the northern segment is still in the exploratory phase of deciding the best route. Planning for the northern segment is under Metrolinx, and all publicly visible work on this stopped for the provincial election in 2018. Every time either of these lines comes up, the inevitable reaction is “sticker shock” from the very high cost of building a new subway into downtown. What is missing from the debate is the high cost of retrofitting the existing subway to handle more riders. Failure to include ATC signals in the design for the Vaughan subway extension. An unworkable plan to run a mixture of ATC (Toronto Rocket) and non-ATC trains (the T1s now on the BD line) on Line 1. Piecemeal contracts for new signal systems resulting in overlapping and incompatible work. This was all sorted out, more or less, a few years ago as one of Andy Byford’s big successes as TTC CEO. For a history of the signalling contracts, please read my article here. However, there is much more to providing added capacity on the subway system, as the TTC gradually discovered and acknowledged through additions to its Capital Budget. Several projects, many of which are not funded, now sit as proposals in TTC plans. 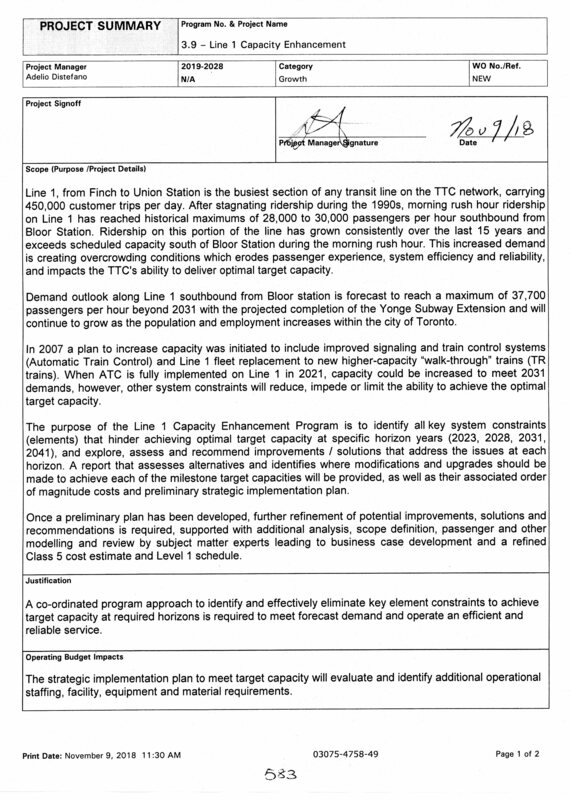 The subway fleet plan, which I reviewed in detail in another article, includes a provision for more trains to increase the level of service and capacity on Line 1 Yonge-University-Spadina. Current peak service requires 65 trains of which 4 are “gap trains” used to fill in where a delay would otherwise create a gap in service. The 61 regular trains provide AM peak service every 141 seconds (2’21”) with half of the trains short-turning at Glencairn. According to the plan, by 2029 there will be 79 trains of which 2 will be gap trains. The 77 regular trains represent an increase of about 26% and would bring headways down to roughly 112 seconds (1’52”). Allowing for some trimming of running time expected with ATC, this would result in Line 1 operating a 1’50” headway which is considered the minimum possible given physical constraints at terminals and the effects of dwell times at very busy stations. However, the fleet of 76 TR trains will only get the TTC through part of this improvement, and there will be a deficit of 9 trains by 2028 as shown above. A 68 train service (70 trains total less 2 gap trains) corresponds to a headway of about 126 seconds (2’06”), an improvement of about 11.4%, and this is the limit of what is possible without more trains. The plan shows trains under the headings of “capacity” and “ridership growth”. However, only part of the proposed procurement (the 18 “capacity” trains) is necessary to get to the 79 train service shown in 2029. The remaining 26 trains, some of which are spares, would not physically fit on the line without extension of all service on the Spadina leg to Vaughan. Whether the north end of the Spadina leg would actually require a 110 second headway is another matter. With the price of a subway train sitting at about $36.5 million (mid 2020s), the 44 new trains proposed here would be worth about $1.6 billion plus the cost of future operation. This project is not funded. A project to expand storage at Wilson Yard is part of the budget, but there is a limit to how many trains will fit there. As the chart above shows, the TTC would run out of storage for trains before all of the proposed new trains are delivered. Future storage depends on a new yard that is part of the North Yonge extension to hold them. There is a catch-22 here in that some might argue for advancing the Richmond Hill project so that its yard would be available sooner. However, this would also advance the point at which more capacity on both the existing Line 1 and the proposed Relief Line would be needed. Much of the TTC’s focus for capacity has been on the signal system and on trains needed to provide more service. However, more service means more riders, and specifically a larger rate for passengers arriving at and leaving stations, and for transfers between lines 1 and 2. There are already problems at some locations with the crush of passengers. Bloor Station is best known, but St. George also has difficulties, and some stations south of Bloor encounter problems with backlogs of passengers trying to leave the platform before the next train arrives. This is particularly severe at locations with limited platform access which can include escalators that are not always in service. There are three projects in the Capital Budget to address these problems. The expansion of Bloor-Yonge Station includes the addition of a second platform to Yonge Station on the Bloor line much like the second platform recently added at Union. This would split demand for eastbound and westbound trains between two platforms. The project also includes additional circulation space on the upper (Bloor Station) level for the connections to the new platform. While this addresses some station capacity issues, it will do nothing to increase service and capacity on Line 2 to carry passengers away from Yonge Station even though increased service on Line 1 will deliver them at a higher rate. This project has a $1 billion price tag, and is budgeted for the first half of the 2020s with completion in 2025. This project is not funded. There is currently no proposal to expand the capacity of St. George Station, and this location is hemmed in by buildings. The project summary for the project is below. elimination of litter at track level which causes fire-related delays. 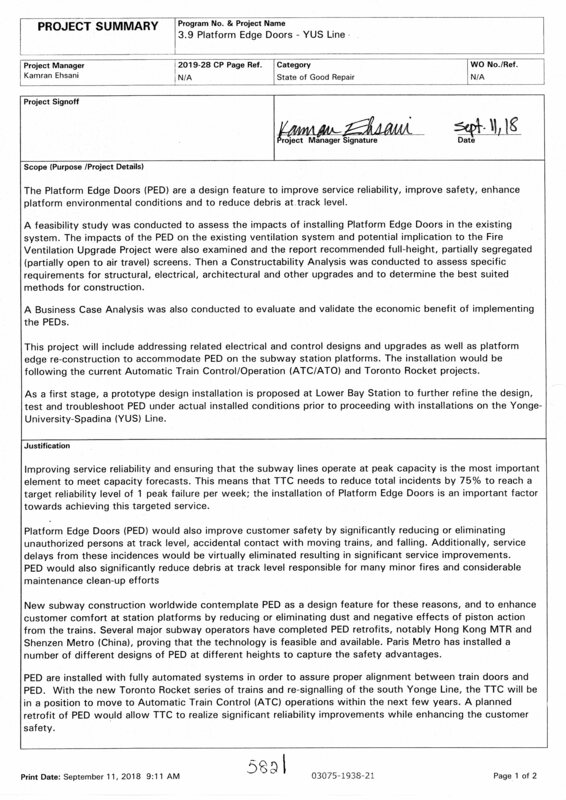 In various public statements, the TTC has been inconsistent about which of these goals is most important, and of course a decision to equip all stations, or only some, depends on what one is trying to achieve. Each is a noble cause in its own right, especially with respect to suicides, but the TTC needs to project a more consistent message on this. Litter at track level varies with the station usage, and is worst at the very busy stations. Recently, a potato, or maybe it was a lemon, became notorious as it spent over a week wedged under the eastbound track at Yonge Station. Whatever it was, this was only part of an accumulation of debris that had built up over a month putting the lie to the TTC’s claim that it cleans stations frequently specifically to avoid the buildup of material which could cause “smoke at track level” incidents. Some problems do not require multi-million dollar solutions. A more recent problem with passengers going to track level to retrieve lost objects, or possibly just as a stunt, is quite another matter. Automatic Train Control (ATC) is an integral part of a PED roll out to provide precision stopping. For Line 1 YUS, the budgeted cost is $610 million with the project spanning the mid 2020s following the full cut over to ATC. In turn, the TTC argues that it will be difficult to achieve the planned 110 second headways with the expected crowding level at major stations unless trains are not slowed on their approach out of concern for hitting waiting passengers. The cost of PEDs is budgeted at $651 million for Line 2 BD as a post-2028 project assuming that ATC will be in place by that time. The PED projects are not funded. The project description from the Capital Budget for the work on Line 1 is below. The Line 2 version is almost identical. Proposed project schedule. 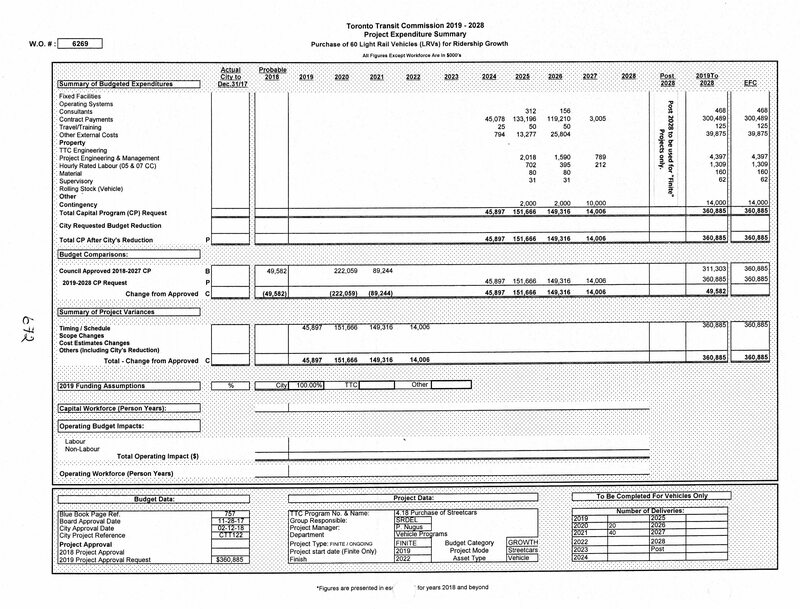 In this chart “BTL” refers to “Below The Line”, that is to say, not included in the funded part of the budget. 2019: Preliminary strategic implementation plan, solutions and recommendations; business case and Class 5 cost estimate. 2020: Program management plan and preliminary design. The bulk of the spending for this project is shown in years 2023-2027, although some work might begin sooner depending on the timing of design, project approval and tendering. There is no indication of the scale of the problem of the locations to be tackled, but the price shows the cost of reworking station capacity in a busy and very constrained set of downtown stations. And, no I am not making up the $5.5 billion estimated cost. 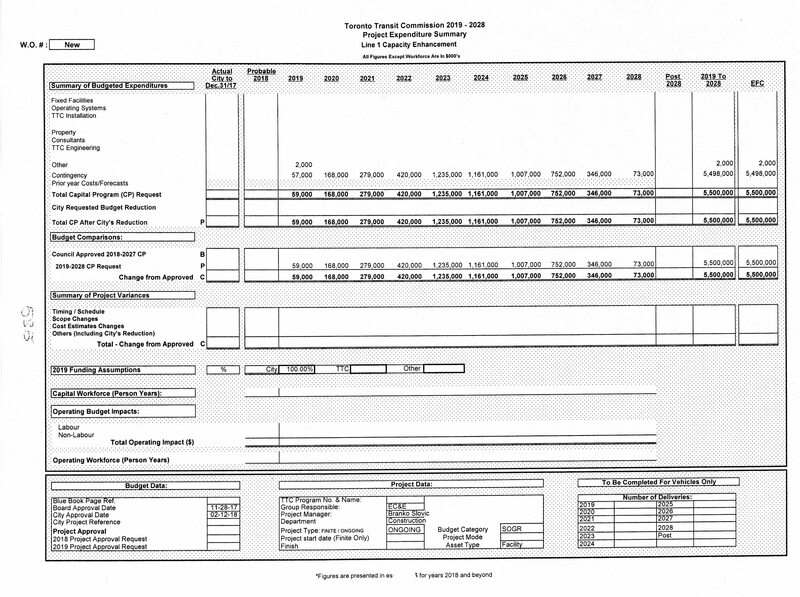 Here is the page showing projected funding and cash flow. To put this in context, this one project is almost as big as the entire funded TTC Capital Budget for State of Good Repair. And of course, that $5.5 billion is unfunded. The cost of providing more capacity on Line 1 Yonge-University-Spadina is far more than Toronto has been told in the past. When this all started, it was simply a matter of a new signal system, but that was only the first of many parts in this story. 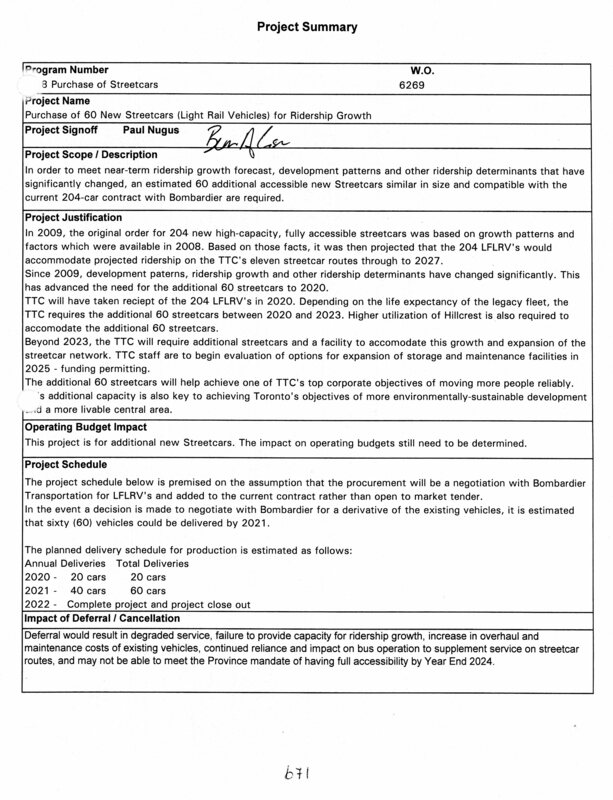 How much of the projected cost here can be trimmed is difficult to say, and that in turn would be affected by the capacity the TTC seeks to operate on Yonge Street. Moving to a full 37k/hour peak demand may not be practical, or could be quite challenging. Meanwhile, the Relief Line project has, until comparatively recently in TTC history, been treated as something the city only needs as a last ditch effort, something to address a long-future problem, not a pressing need today. Toronto has been ill-served by the attitude that the Relief Line is a project for another day, not to mention its characterization by some politicians that it is only a project for coddled downtowners. Tell that to people who cannot get on the Yonge Subway, many of whom live far north of Bloor Street. The division of the RL planning into a south-of-Danforth segment separate from the northern extension means that the substantial benefit of intercepting riders east of Yonge well north of Bloor-Danforth is many years in the future. The TTC owes Council a thorough discussion of capacity issues on the subway network including all of the interrelated projects needed to deal with present and future demand. For far too long, many projects have been discussed in isolation from each other, or simply have been ignored. This is an issue for politicians at both Toronto and Queen’s Park who downplay the cost and complexity of a provincial takeover of responsibility for the subway and its funding. Even if the subway remains in Toronto’s hands, there are huge costs facing the TTC and its “funding partners”. Nothing less than the credibility of transit as an engine for the city’s growth is at stake. As I write this on March 20, 2019, the TTC has received cars 4400-4535 from the Thunder Bay plant and 4572-4573 from Kingston. Of these, prototype 4401 is at Bombardier for production refits, and a pool of four to six cars will be out for major repairs for the next few years. CEO Rick Leary has stated on a few occasions that the buses now on streetcar routes will come free for service on the bus network by year end when all new cars have arrived, and that all of the legacy CLRV/ALRV (standard sized and two-section articulated cars respectively) will also be retired this year. This directly contradicts his own Capital Investment Plan which shows that buses will still be required into the mid-2020s when, in theory, a further order of 100 streetcars would arrive. However, even assuming that Bombardier does deliver the last of its order up to car 4603, there will not be enough new cars to cover service on all of the lines. 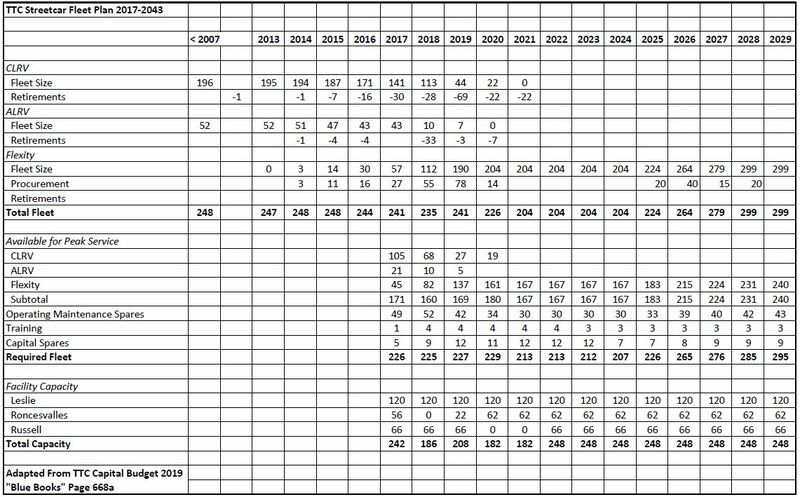 The table below compares service as it existed back in 2006 before the new cars were ordered, the TTC’s plans for Flexity implementation in 2013, the current schedule requirements, and the number of streetcars needed if all routes return to rail operation. The 2006 AM peak service requirement for all streetcar routes assuming that there are no construction projects underway. This is a blend of sources to avoid diversions and substitutions. The actual service in March 2019 (current). The streetcar service operated a few years ago on routes that now have full or partial bus operation. A hypothetical March 2019 service assuming that the five routes now with buses (511 Bathurst, etc) were operated using streetcars. The TTC’s June 2013 deployment plan for the new cars. A hypothetical March 2019 service assuming current Flexity service for routes that have already converted such as King, and the 2013 deployment numbers for routes that have not. For the purpose of this discussion, the ALRV fleet is assumed to have been retired even though, officially, schedules still call for five of them to run on 501 Queen. In practice these, and some CLRV runs, are operating with Flexitys. The total fleet requirement including spares at 20% would be 216 cars, and this is 12 more than the TTC will actually have without allowing for a half-dozen cars undergoing major repairs. This means that it is impossible to operate the streetcar system without either trimming service or leaving buses on some routes. When there are construction projects that block streetcar service (such as the work by Toronto Water now underway on Dundas), there would be enough cars operate the rest of the network. Otherwise, the most likely candidates for buses are the perennial targets, the Kingston Road services 502/503. Some routes – King, Spadina and St. Clair – have more service today than the 2013 deployment plan provided, but this means that there are not enough cars to handle the rest of the network as originally planned. Service improvements on the streetcar system are limited to the added capacity that Flexitys will provide on routes still using old cars (e.g. Queen), but there is no headroom from 2020 onward. In the 2018 Capital Budget, the TTC planned to acquire 60 more streetcars in 2019-20 for ridership growth, and 15 in 2020-21 for new Waterfront service. In 2019, this has changed to a larger order in the mid-2020s. However, the budget is inconsistent in its presentation of needs and timing. The chart below is adapted from the fleet plan as it appears in the budget. (The copy I have is in black and white muddying some details depending on colour.) This shows a proposed purchase of 95 cars in 2025-28. It is already out of date because the CLRV and ALRV fleets will be retired sooner than planned. This creates a shortage that prevents full return to streetcar service at the end of 2019 when the Flexity deliveries are supposed to be complete. Projections out to 2043 show a very substantial increase in the streetcar fleet to almost double the planned fleet in the early 2020s. That’s a lot more streetcar service than we have today. However good this might look, it does not address the challenge that there are not enough cars for the lines and service levels today, and this will not change in the near future. A few pages later in the budget is a project to purchase 60 new cars which clearly shows the need for 60 cars starting in 2020, with even more in the future. Of particular note is the text about the effect of deferral on service. This project description is obviously out of date, but that is a common problem with the budget. The actual spending has been moved to 2024-27. It goes without saying that whatever the date, this is an unfunded project. A further problem lies in the planned renovation of Russell Carhouse to handle Flexity maintenance similar to the work now underway at Roncesvalles. This will take that site out of operation for two years. Without Russell’s capacity, there would not be enough room to accommodate the extra 60 streetcars if they were procured as originally planned. The TTC is also considering major changes at Harvey Shops which, as currently configured, can only be used for a small number of Flexitys. The scheme is to revise the layout of tracks and service areas, and to make this an operating site for, at least, the fleet needed on 512 St. Clair. This would very substantially reduce the dead head mileage for 512 St. Clair cars that shifted to Roncesvalles Division from the carhouse at Wychwood, only a short distance north of Hillcrest, in 1978. However, this capacity would not be available until 2028, and the Fleet Plan shown above does not include it. That site would also substantially increase storage capacity on the streetcar system because, in another project, the TTC proposes shifting bus maintenance operations to a new as yet unknown location. This is separate from the construction of another bus garage in the 2020s. All of this assumes that money will be found to pay for the larger fleet and facility changes needed to accommodate it. In the chart below, all figures are in billions of dollars including inflation. 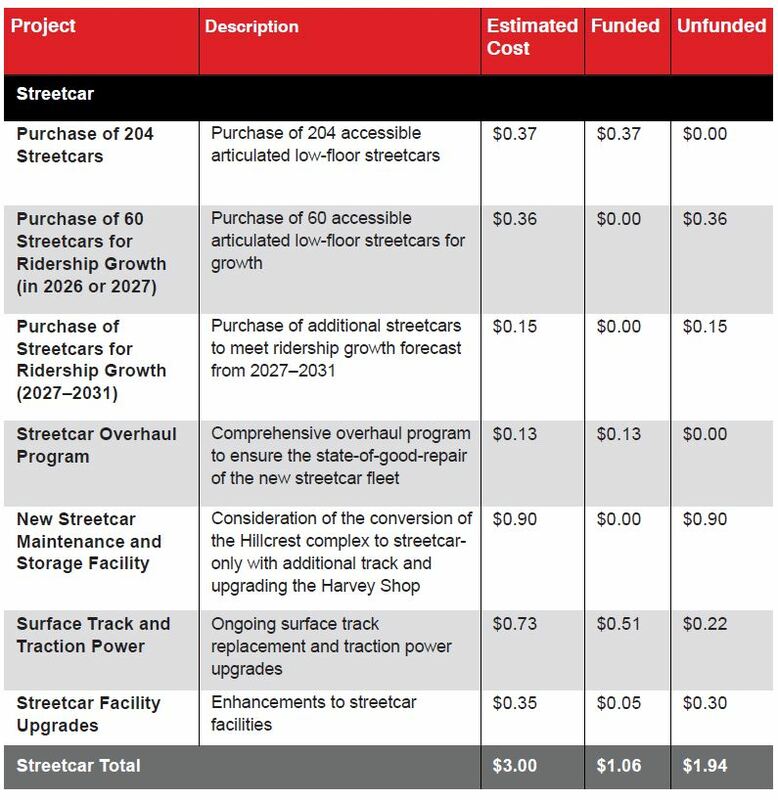 Note that the $370 million for the current 204-car purchase is the remaining money to be spent in years that are part of the Capital Investment Plan, not the total project cost. 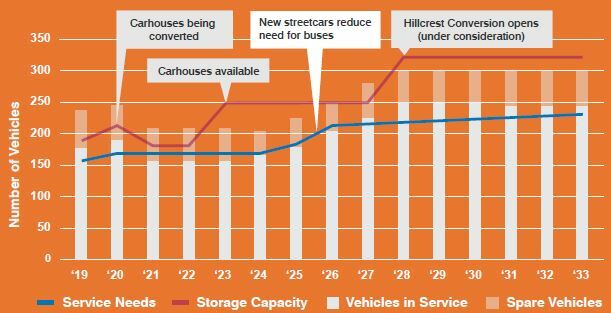 The TTC clearly has plans to improve and expand the streetcar system, but there is a deadly combination of constrained capacity growth and rising demand which will not be addressed in the short-to-medium term. That drives potential riders away from transit and adds traffic that streets cannot absorb more demand. For many years, growth in bus service has been limited because the TTC has no place to put more buses even if they bought them. This allowed TTC management to avoid the basic issue of how much service was really needed, and budget hawks on Council to avoid increasing TTC subsidies to pay for this. 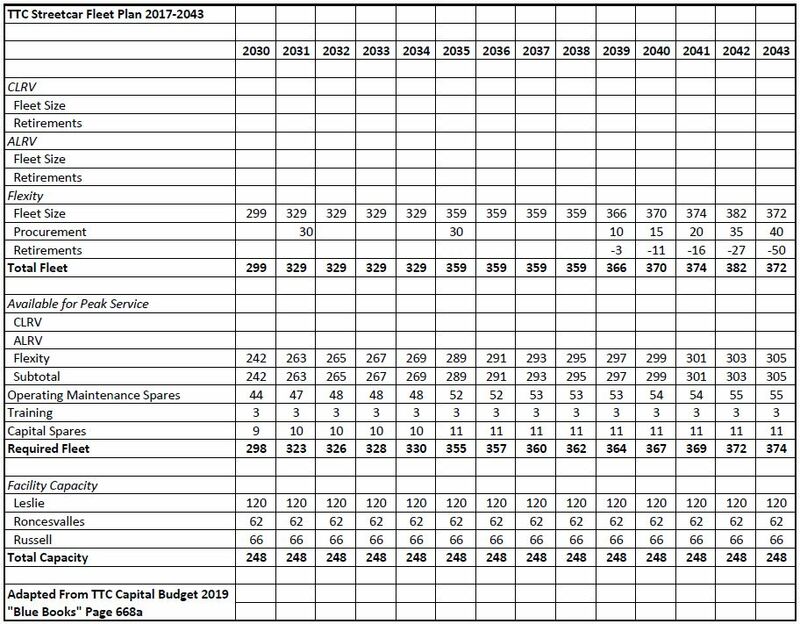 The chart below is adapted from the fleet plan in the capital budget. 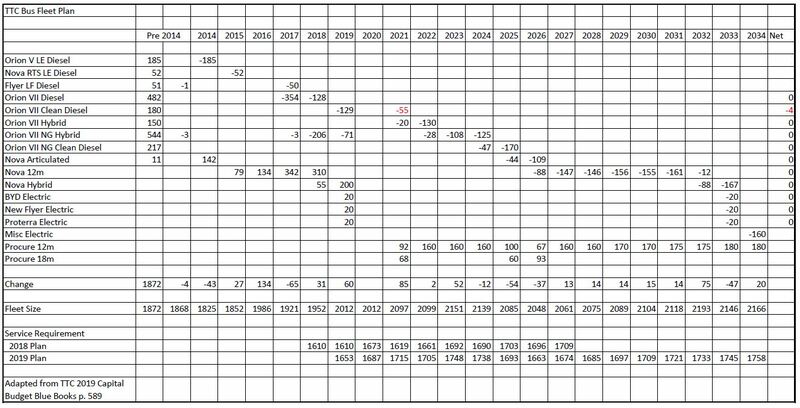 The first column shows the fleet makeup before 2014 and then shows the procurements and retirements over the period to 2034. The “Net” column is a check on the arithmetic to ensure that the numbers actually net out. There is an error highlighted in red where the TTC claims it will retire more buses than it actually owns. This has only a small effect on the future fleet size (five out of two thousand buses). There are 200 hybrids and 60 electric buses in the 2019 budget, followed by a pause for one year in 2020 when there will be no purchases. This is partly a result of timing pressure to spend federal PTIF dollars within the required window, and partly to provide an evaluation process for the electric buses. Electric bus purchases will begin in earnest in 2021 with the last of the existing diesel and hybrid fleet being retired by 2033. The Eglinton Crosstown LRT opens in 2021 replacing frequent bus services on several routes. The Finch LRT opens in 2023 replacing bus service west of Keele Street. The Scarborough Subway Extension opens in 2026 shifting the termini of many routes to STC station. The planned expansion of the streetcar fleet in the mid 2020s eliminates the need for buses to supplement/replace streetcar services. The use of articulated 18m buses will increase by 68 vehicles in 2021 if this plan holds. The next round of artic purchase in 2025-26 will replace the 153 diesel artics now in the fleet, but there are no net additions. 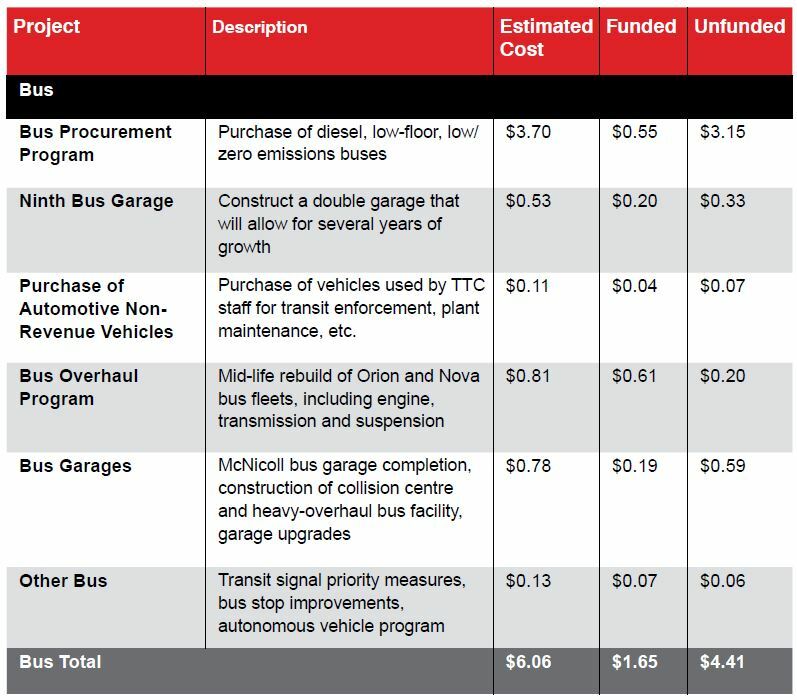 With the shift of the bus fleet to electric operation, the TTC plans to convert its garages at a rate of two per year. However, they have not produced a plan that aligns this conversion with the rate at which electric vehicles will replace diesels and hybrids. Garage space continues to be an issue. The current capacity across seven garages is 1,631 buses compared to a total fleet of 2,012, a shortfall of 381. Even when McNicoll Garage opens in 2020 adding capacity for 250 buses, there will still be a shortfall with system capacity of only 1,881. A ninth garage to add a further 250 spaces is not planned to open until 2031. That garage, like many projects, sits in the “out years” of the capital plans so that it does not contribute to the shortfall in available funding over the 10-year span of the budget. This puts the TTC and its would-be customers in a long-standing box when looking at service improvements. For another decade, Toronto will be told that there is no room for more buses beyond the current fleet plans. The planned growth in peak service from 2026 onward is under one per cent per year. TTC management plans to bring forward a service plan later in 2019 which will examine future demand. A vital part of such a report will be to look not just at minimal ridership and fleet growth, but to consider what happens if service improves at a substantial rate. Oddly, there is provision for this in the streetcar fleet plan, but not in the bus plan. The 15-year Capital Improvement Plan includes construction of a collision centre and heavy overhaul facility for the bus fleet. This would release space now used at Hillcrest allowing it to be repurposed as a new streetcar shops and depot. The engine shops now at Hillcrest would become obsolete with the migration to an all-electric bus fleet.